The Radisson Blu Hotel provides a convenient and scenic accommodation for guests looking to enjoy all there is to see and do in Athlone. 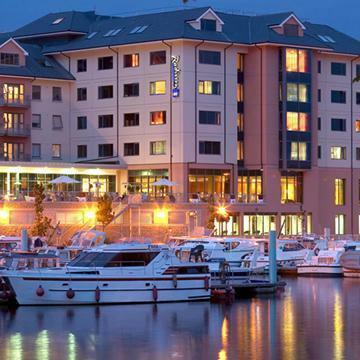 Stay within walking distance of the Athlone Marina, Athlone Castle and public bus and train stations. Along with a lovely riverfront setting, the hotel offers 128 rooms and suites with conveniences like 24-hour room service and Free high-speed, wireless Internet access. For an upscale dining experience, visit the on-site Elements Bistro. Also onsite, the Quayside Bar & Lounge provides an elegant setting overlooking the water for sharing food, drinks and good conversation with colleagues or loved ones. After a full day of meetings or sightseeing, relax in the sauna, take a dip in the heated pool or work off stress at the fully equipped gym. Additionally, the hotel offers 10 professional meeting spaces suitable for both business or social gatherings of up to 650 guests.